The Hispanic Heritage Foundation announced the 2015 Hispanic Heritage Awards honorees who will be recognized at the 28th Annual Hispanic Heritage Awards, presented by Target on September 17 at the Historic Warner Theatre and broadcast October 9 on PBS during Hispanic Heritage Month. Legendary actress, singer and previous Hispanic Heritage Award recipient Rita Moreno, will be hosting the program and perform. "The Hispanic Heritage Foundation is proud to partner with Target and all our sponsors to honor yet another visionary group of Latino leaders with the Hispanic Heritage Award and share our cultural pride, accomplishment and great promise with all of America," said Jose Antonio Tijerino, President and CEO. "We are also excited about the great line up of performances led by the incomparable Rita Moreno. The evening will certainly be entertaining, meaningful and inspirational." 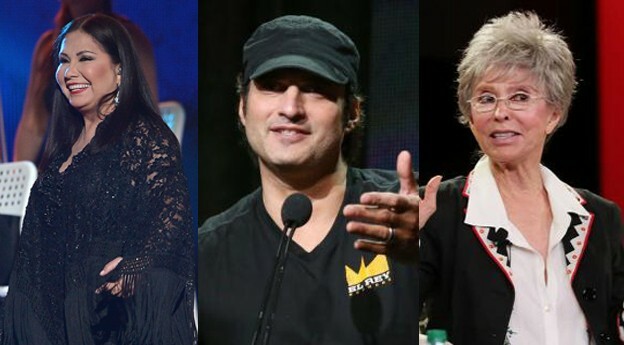 The 2015 Hispanic Heritage Awardees are: Director Robert Rodriguez for Vision, presented by Hershey's; musician Arturo Sandoval for Arts, presented by Southwest Airlines, (the Official Airlines of the Hispanic Heritage Awards); healthcare Provider Maria Gomez for Healthcare; singer Ana Gabriel for Legend and scientist Dr. Vladamir Alvarado for STEM (Science, Technology, Engineering and Math), presented by ExxonMobil. The White House Initiative on Educational Excellence for Hispanics for Education, presented by Target; Hall of Fame Pitcher Pedro Martinez for Sports and a special Recognition to Singer Becky G for Inspira, serving as a role model for youth in the public eye, presented by Hispanic Heritage Foundation. The Hispanic Heritage Awards were established in 1987 by President Ronald Reagan to commemorate the creation of Hispanic Heritage Month in America. Since that time, the Hispanic Heritage Awards are considered among the highest honors for Hispanics by Hispanics. The Awards are unique in that celebrities take the stage with educators, innovators, community and business leaders, elected officials, among others. The Awards are supported by nearly 40 national Hispanic-serving institutions who co-host the program. Past Honorees have included Juan Luis Guerra, Rita Moreno, Placido Domingo, Celia Cruz, Antonio Banderas, Tito Puente, Anthony Quinn, Carlos Gutierrez, Juan Marichal, Los Tigres Del Norte, Jose Feliciano, Isabel Allende, Alejandro Sanz, Oscar de la Hoya, America Ferrera, Gloria Estefan, Martin Sheen, Oscar de la Renta, Andy García, Carlos Vives, Juanes, and Zoe Saldana, among many others. Performances this year will include Rita Moreno, Lila Downs, Arturo Sandoval, Ana Gabriel, Gaby Moreno, and Becky G. Opera Singer Carla Dirlikov will sing the national anthem.